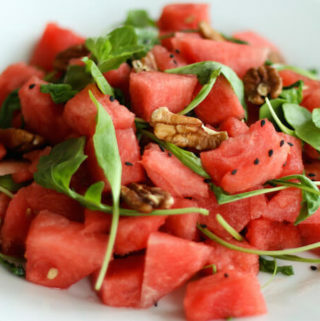 Watermelon and arugula salad is a quick and healthy summer salad recipe. The slight bitterness of arugula leaves is perfectly balanced with the sweet juiciness of watermelon in this salad. Mint and pecans add flavour and texture and chia seeds bump up the nutrition. The salad dressing is also very light with just some fresh lime juice, rock salt and maple syrup. You can add a little pepper to spice things up but I like this salad just like this. Watermelon is the summer defining fruit. Juicy, sweet and very very refreshing. I can’t imagine summers without watermelons. As children, during the entire summer holidays every afternoon we used to sit with our plates of cut watermelon slices and have all our faces into them 🙂 . I am sure we were a sight! Even now my favourite way of eating watermelon is by just dunking my teeth into a juicy slice… But when it comes to meals, watermelon salad is the next best thing. Arugula or Rocket leaf is one of the healthiest leafy greens. It is a detoxifying, cancer-fighting superfood! It can also be easily grown at home. Arugula salad needs something sweet and juicy like watermelons or apples and pears to create a nice flavour balance. Very refreshing and light, this watermelon and arugula salad makes a perfect side dish for summer BBQs and dinners. For 4 people, this salad only needs about 4 cups of watermelon, which is like half of a big whole watermelon, so don’t forget to make some dessert sorbet with the remaining! 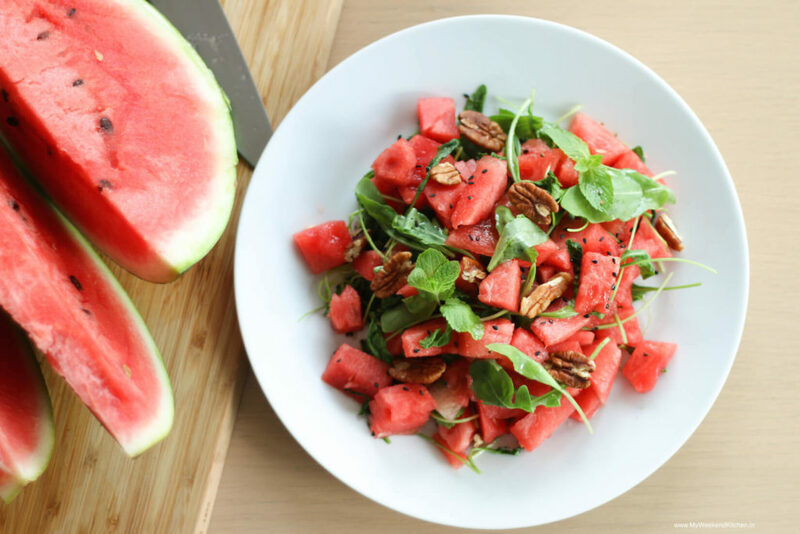 This watermelon and arugula salad is a quick and healthy summer salad recipe. The slight bitterness of arugula leaves is perfectly balanced with the sweet juiciness of watermelon in this salad. In a large mixing bowl, add the maple syrup, rock salt, zest the lime and squeeze out all the juice. Whisk together with a fork. Add in the chopped watermelon and gently toss to coat the watermelon with the dressing. Add mint and arugula leaves. Toss to combine. Sprinkle pecans and chia seeds. Check and adjust for seasoning and serve chilled. This salad recipe is ideal for low-cal, vegan and gluten-free diets. In this salad I add pecans just like that because I wanted to keep everything raw, but sometimes I also add caramelised walnuts to the watermelon salad. They add a toasty flavour. Rock salt (also known as himalayan black salt) is known for its cooling properties and is very often used in summers. If you don’t have black salt, use regular salt or coarse sea salt. What is your favourite way of eating watermelons? 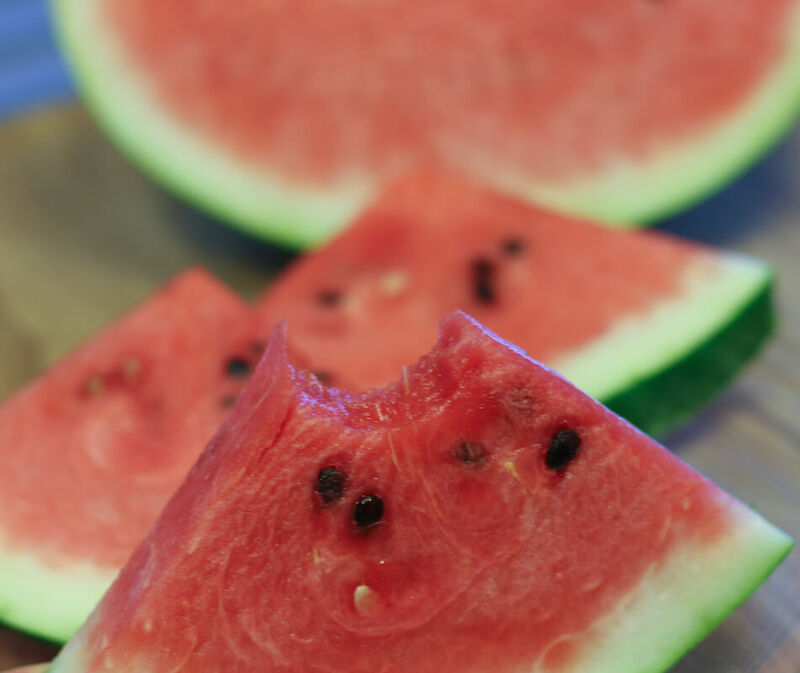 Any special childhood watermelon-y summer memory? Did you make this wonderful summer salad? Send me a picture, leave a comment or connect with me on Facebook, Twitter, Google+, Pinterest and Instagram. Would love to start a conversation, share recipes, cooking experiences and food stories from India and around the world.